Two years ago, media academic Sharon Mascall-Dare wrote about how journalists every year slip into a standard Anzac Day reporting mode. Look for an old Digger, some attractive young kiddies waving flags, and someone crying, find something new (Indigenous servicemen leading the march in Canberra) to counter the clichés, compare the numbers with last year, quote some speeches, be ‘surprised’ by the prime minister’s ‘surprise’ visit to a war zone, and so on. The reporting of occasions like Christmas, Easter, Grand Final Day and Melbourne Cup Day has similar conventions. Oh, and find a ‘scandal’, too, if possible. Two years ago, it was Scott McIntyre’s incautious remarks, this time it was Yassmin Abdel-Magied’s. Here’s a round-up; it is not meant to be comprehensive, just a sample. As with our pre-Anzac selection, we’ve tried to get a little beyond the tropes listed above. A notable speech was that at the Canberra Dawn Service from Sapper Curtis McGrath, who lost both legs in Afghanistan, and later won Gold at the Paralympics. In the aftermath of so many conflicts [Sapper McGrath said] men and women come home to a silent, private suffering, borne alone or with their distraught families, friends and communities. In return, our nation is learning an ethic of care to our wounded veterans, service personnel, whose ripples spread right across Australian life, a true measure of a nation’s decency and worth. An article on the ABC website suggested there is still some way to go in dealing with the consequences of service. Less impressive were various examples of commercial Anzackery, mostly in night clubs and bars, exposed by the New Daily and the ABC. Who knew wet t-shirts were still a thing? Still, it was Darwin. Hidden away on the Internet, there was also Anzac Day Selfies, with lots of bright young folk in spiffy haircuts, tatts, and sometimes not much clothing, wishing each other ‘Happy Anzac Day’. ‘I’d wear a poppy everyday if I could’, said one young gent, ‘and it will still never be enough to thank all of those who lost their lives for us to live the way we do’. 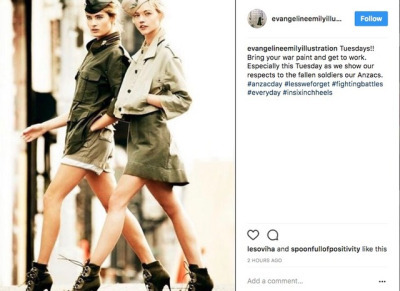 This was followed by a spray of hashtags, including ‘AlwaysGrateful’, ‘lessweforget’ [sic], ‘heroes never die’, ‘signmeup’, and ‘imalivebecause of you’, and 35 ‘likes’. Honest History has taken the view that the whole Anzac centenary period is a good time to broaden our appreciation of the many strands of Australian history, past and present. Ms Abdel-Magied’s remarks were in this spirit and it is perhaps a pity that she felt the need to withdraw them. Contributing to the Twitterstorm today, the present writer made these points and added – to the things we should not forget – matters such as domestic violence, child sexual abuse, misogyny, post traumatic stress disorder, poverty, Indigenous disadvantage, and the Frontier Wars. These comments seemed not to cut through with the Boltsters. Even some reasonably level-headed people were upset though, having some experience of how the ‘situational awareness’ tool can be wielded to curb awkward views, the present writer was fairly relaxed about it all. Meanwhile, across the Tasman, a remarkably articulate lad almost shrieked about the inappropriateness of protesting on Anzac Day. (Update 8 May 2017: Turned out it may have been a set-up, though.) More soberly and with much more balance, there was Honest History committee member, Carolyn Holbrook, on the history of the Anzac concept and Honest History vice president, Alison Broinowski, on some perpetual implications and some new ones, taking account of our current wars. Instead of prolonging the current war [in Iraq and Syria], we could usefully investigate how to stop fighting and help with reconstruction. And instead of suppressing the facts and learning nothing, our government should hold an inquiry into how we entered the wars in Afghanistan, Iraq and Syria and, as other Western countries have done, publish the results. Her chapter in The Honest History Book is right on point. And the reference in the heading – ‘On every Anzac Day’? That’s the title of a song by John Schumann (available along with ‘Anzac Biscuits’, another song). Our original story about it is here; we saw in the song’s lyrics an indication of the Australian War Memorial making a gesture about wars fought not overseas but in Australia, by Indigenous Australians on their country, for their country, against Anglo-Celtic invader-occupiers. This Anzac Day, as well as Indigenous ex-service people being at the head of the Canberra march, Indigenous service men and women featured in ABC pieces by Stan Grant and Bridget Brennan. Paul Daley’s chapter in The Honest History Book covers the stories of both Indigenous serviceman, Douglas Grant, and the Frontier Wars; the War Memorial, despite its initiative on the Schumann song, has been reluctant to be more explicit about the Frontier Wars. 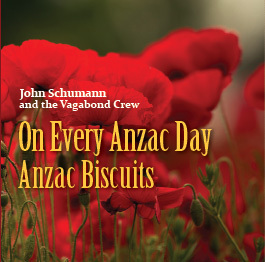 Schumann’s song is here; it might be slightly discomforting for those brought up on traditional Anzac fare. Perhaps they might reprise their reaction when the first Easter Bilbies threatened to replace traditional Easter Bunnies: just a small step to the left but it’s still chocolate. Here are the key words of the song, with a white Anglo-Celtic soldier talking to a black Digger. 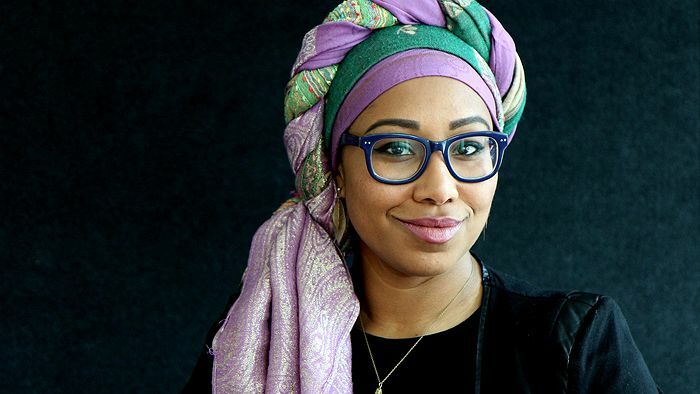 Perhaps Yassmin Abdel-Magied on this Anzac Day might have got away with words as challenging as those of the black Digger in the song. Perhaps, but in 2017 black Diggers seem to be more acceptable than feisty young Muslim women.